I realize I am a couple days behind on this, due to my 'real job', this is the first chance I have had to sit at my computer. San Diego, Calif. – August 3, 2018 – iHeartMedia San Diego’s KGB-FM, San Diego’s Classic Rock, announced today the return of the DSC show to the morning drive, effective Monday, August 6, 2018. 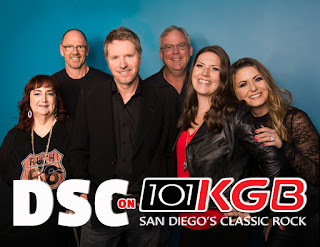 The new DSC will include show members Dave Rickards, Cookie “Chainsaw” Randolph, Chris Boyer, Nina “Ruth 66” Reeba, Emily Maguire and Sarah Beebe, and will broadcast weekdays from 6 – 10 a.m.
DSC combines news with a healthy dose of humor to create San Diego’s most dependably hilarious morning show. It has a long history with KGB-FM that began in 1990 when Dave Rickards moved to San Diego from Denver to team up with original co-hosts Shelly Dunn and Chainsaw for a show that was initially calledThe Dawn Patrol. In 1994, the show moved to its sister station KIOZ-FM and became The Dave, Shelly, and Chainsaw Show. After three years at KIOZ-FM, they made the move back to KGB-FM where they hosted morning drive for another 13 years. It was during this time with KGB-FM, that the team started referring to the show as DSC for Dave, Shelly and Chainsaw. Most recently, the show was heard on KFMB-FM where Shelly Dunn announced her retirement. The return of DSC to KGB’s morning drive timeslot on August 6 will mark a new programming lineup for the station. The Bob and Coe Show will move from mornings to afternoon drive, Clint August will move from afternoon drive to host middays, and Marc Coppola will host nights. 101.5 KGB-FM is the leading media outlet in the San Diego market with multiple platforms, including its broadcast stations; live events; data; and its digital businesses and platforms, including mobile, social and its own iHeartRadio, iHeartMedia’s free all-in-one digital music, podcasting and live streaming radio service – with more than 1.7 billion app downloads and 110 million registered users. iHeartMedia San Diego owns and operates KGB-FM; KHTS-FM; KIOZ-FM; KLSD-AM; KMYI-FM; KOGO-AM; and KSSX-FM, and is part of iHeartMedia. With over a quarter of a billion monthly listeners in the U.S. and over 131 million social followers, iHeartMedia has the largest national reach of any radio or television outlet in America. As the leading audio and media company in the U.S., iHeartMedia serves over 150 local markets through 849 owned radio stations, and the company’s radio stations and content can be heard on AM/FM, on satellite, at iHeartRadio.com, on the company’s station websites and on iHeartRadio, iHeartMedia’s digital music, podcast, on demand and live streaming radio service, available on over 250 platforms and 2,000 devices, including on digital auto dashes, tablets, wearables and smartphones, on virtual assistants, smart speakers, TVs and gaming consoles. iHeartRadio offers the country’s top live radio stations, personalized custom artist stations created by just one song or seed artist, on demand features and the top podcasts and personalities. The all-in-one digital service has more than 1.7 billion downloads, 110 million registered users and is the No. 1 commercial radio podcaster in the U.S.